Apologies that my last post had absolutely nothing to do with yoga. So here we go-->back on track. This morning during yoga class I fell over in reversed triangle pose. No, I didn't fall out of the pose... my triangle literally toppled over whacking the woman beside me. She was very forgiving, but I was less forgiving to myself as I tried to jump back from crow to chaturanga and belly-flopped smacking my nose into the mat. What is happening to meeeee???!!!! I'll tell you what happened: I took two whole days off from yoga which extinguished my ability to make it through an entire class without causing an apocalyptic domino effect. Muscle memory? Ha! My muscles have amnesia. There is only one thing I can blame: having the day off work. Fact: until Sunday I hadn't had a day off work since January 15th. Other Fact: I decided to take full advantage of my one day off. From Saturday night at 7pm to Monday morning at 5am, I utilized every single hour living life to its fullest. Sleep would have impeded on my fun so it was skipped. So was bathing. Where did I spend my 34 hours of freedom? I discovered The Man Cave on New Years Day of this year. I was too busy getting broken up with on New Years Eve to muster any energy to go out, so I brought in the new year snuggling with the dog. I went to bed early and the next day I woke to find a man sitting on my couch. The man grinned widely while he explained how he'd been out partying all night and in the wee hours stumbled upon my house (that's what I get for living downtown). My roommate's houseguest had let him in and now here he was! The man was very hungry and thirsty (hangover) so I fed him breakfast. The man then described how in an attempt to get some new years booty he had lost everything. No car. No phone. No wallet. Not even a jacket. The man was lost in this world with no identity, no means of communication, and no way to get back home. He hopped in my car and together we rode around the town stopping by his friends' homes asking them to help him piece together the puzzle of the previous night. Two hours later we found his jacket with the phone and wallet in it, stopped to get coffee, and then I drove him back toward his hometown. Along the way, the man suggested we go for a hike so I steered us to a local park and we spent time bonding in nature. The daylight had begun to fade and it was time to take the man home. He directed me to his house and invited me in. Obligingly I went and it was there that I encountered The Man Cave. In The Man Cave reside three men, all in their late 20s. Three single men I might add. Which made my first night there slightly awkward. 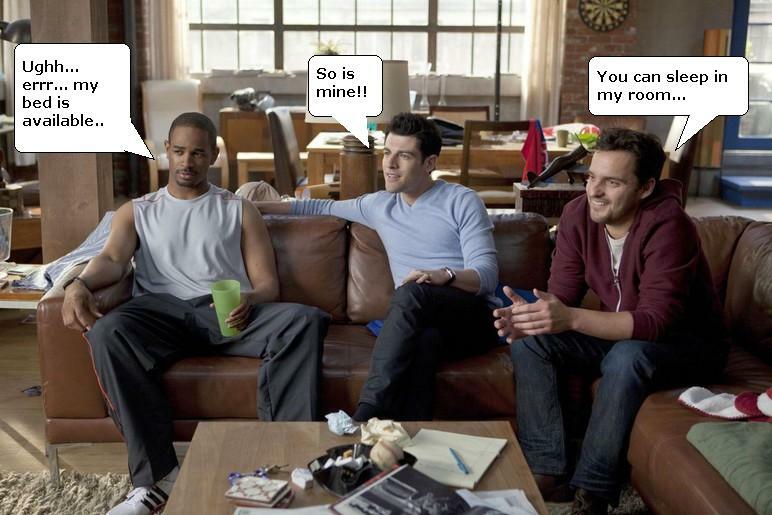 But after the awkwardness passed I soon realized that the four of us together were none other than.... the cast of New Girl! 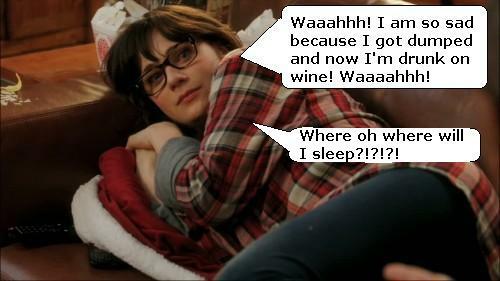 Starring my girl-crush, Zooey Deschanel. Each member of The Man Cave has his assigned character and as we watched an episode all together, the boys were dumbfounded to see that the characters were in fact their very own personality doppelgangers! In case you were wondering, the man that appeared in my house was the Schmidt doppelganger. But if you've seen the show, that shouldn't surprise you. Henceforth, I will only refer to the boys by their doppelganger names. And thus a beautiful friendship was born. Eventually the boys mostly stopped shamelessly hitting on me and we all became friends. And it was with them that I spent my 34 hours of freedom. Which is why come Monday morning I could barely lift my eyelids. And why instead of taking yoga class Monday morning, I slept on the sofa in the yoga studio (true story). And it is why today my sense of balance is completely off and why red wine now flows through my veins where blood used to be, slowly intoxicating my muscle memory. And I don't regret it one bit! Now I know why you looked so tired when I saw you sitting on the couch on Monday morning. I LOVED this post, Melanie....and I LOVE that show!!! YOU GOT WICKED HAWT BLOG! So...dude...does... this...mean like we cant like date or anything? WHOA.DUDE. ME NOT UNDERSTAND WHY YOU NOT WANT TO SLEEP IN CAVE!